Today was the last day of summer… too bad the work isn't finished. Sigh. I wish that I had two more weeks of summer – one to finish the kitchen and one for vacation. Wait. Who am I kidding? O.K. so I need two more weeks to finish the kitchen. From now on I will be restricted to working in the evenings and on Saturdays. I did install the pullouts beneath the kitchen sink. I also finally got the dishwasher installed. It took three times as long as it should have. If something could have gone wrong, it did. I did get a few more little things done like installing several doors, adding the “fake door” on the end of the wall cabinet, putting the first coat of polyurethane in the refrigerator and stove area (they’re marked off with tape,) installing the window locks and cranks, and insulating the duct work. Now if only I could get those two drips under the sink stopped. 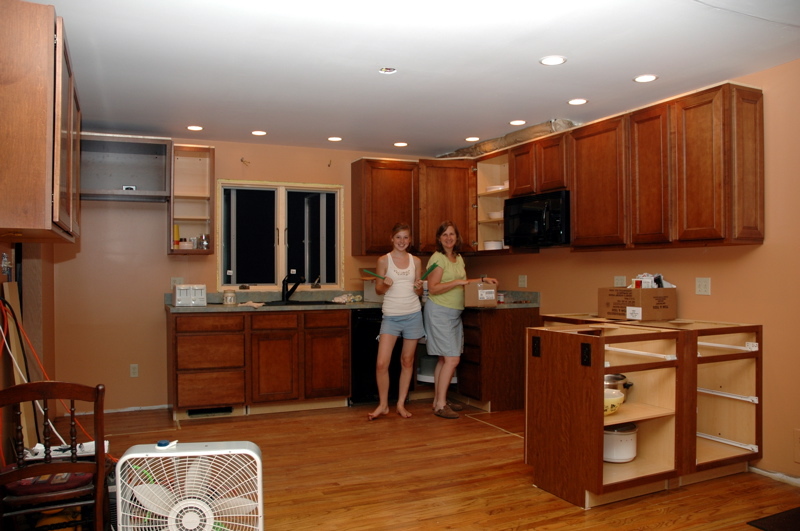 Sharon and Janelle started moving stuff into the cabinets. The picture shows them doing so.